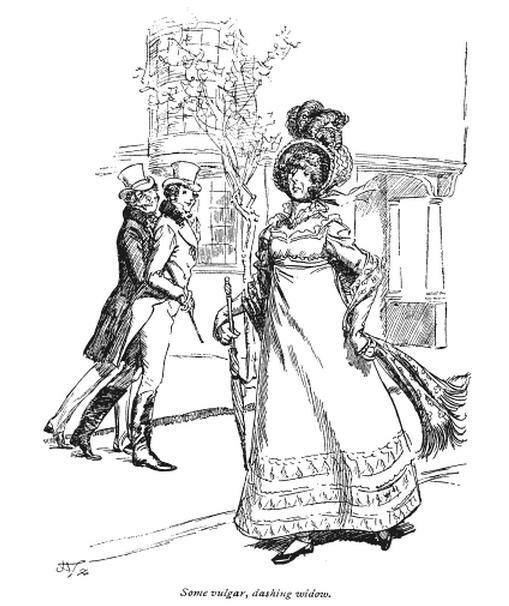 Jane Austen’s novels did not ignore the rising middle class and successful merchants and tradesmen, the nouveau riche of her era. Mr. Bingley and his sisters were the fortunate offspring of a tradesman. 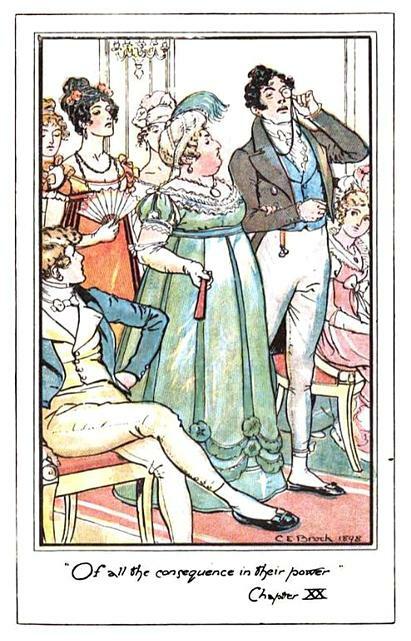 Mrs. Bennet’s, Mrs. Jennings’, and Mrs. Elton’s vulgarities cannot be denied and add spice to her tales. A real life representative of the rich bourgeois class was Mrs. Smith, once married to a trader named Kinnear. I would imagine that if a stranger met her, there would be no mistake from her demeanor and accent where her origins lay. She dressed well, according to an eye witness, and managed to live out her years in comfort. 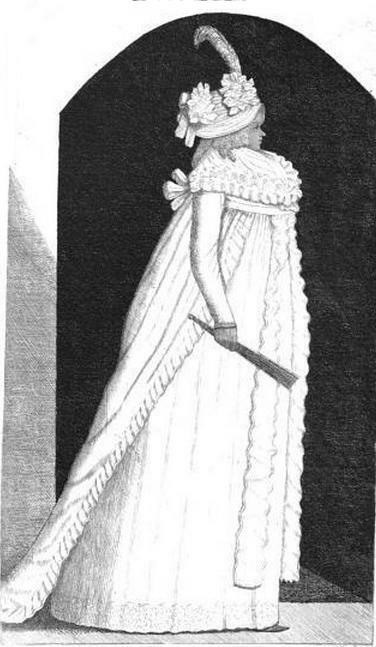 MRS SMITH IN THE COSTUME OF 1795. That this Portraiture was sketched without a sitting may be conjectured from a memorandum by the artist, which states that when the lady heard of his intention to publish her likeness, she sent for him to come and get a proper look at her, but he did not choose to accept the invitation. Those who remember Mrs Smith will have little difficulty in recognising a strong likeness to her in the Etching. Mrs, or rather Luckie Smith, for so in her later years she was uniformly styled, is dressed in the somewhat ridiculous fashion prevailing towards the close of [the] last century. The Print bears the date 1795, and at that period she resided in South Bridge Street. Some years afterwards, she removed to a house purchased for her in Blackfriar’s Wynd. Mrs Smith was a native of Aberdeen, and had in early life been married to a trader of the name of Kinnear, by whom she had a son and two daughters. After the death of her husband, she resumed her maiden name of Smith. Her favourite walk was the Meadows. She was a stout, comely looking woman, and usually dressed well. She lived to old age in the enjoyment of two annuities, one of which she derived from a gentleman of fortune, the husband of one of her daughters. The other daughter was also well married, and we believe is now in America. Mrs Smith died in January, 1836. – A series of original portraits and caricature etchings, Volume 2, Part 2 (Google eBook), John Kay, 1838, p425. The description might remind Georgette Heyer fans of Mrs. Floore from Bath Tangle. That “redoubtable old lady had inherited, besides two fortunes, considerable interest in her father’s soap factory, and her husband’s shipyard.” Hah! Can you imagine the Miss Bingleys hobnobbing with Mrs. Floore, or Sir Walter Elliot entertaining her in his house in Bath? ‘Serena!’ breathed Fanny. ‘What an extraordinary creature! Times were a-changing. The rising middle classes were able and willing to lay out ready cash to move up in the world. What they lacked (aside from refinement) were land and a nice title. The aristocrats had these aplenty. Since many a landed family had squandered their fortunes, it was inevitable that the lines of distinction would begin to blur as the nouveau riche began to snap up estates in foreclosure or shove their very rich daughters in front of impoverished heirs.